About Me – About The Journal Of Antiquities. OS grid reference NJ 0465 5953. At the east side of the village of Forres before reaching the B9011 road turn left into Findhorn road and on the opposite side of the road in a field stands the famous Sueno’s Stone, a very tall class III Pictish stone/cross-slab, which since the 1990s has rather unfortunately been housed within a horrid glass, protective cage – although it is now stopping any further erosion to the beautiful Pictish carvings, so that has to be a good thing. It used to stand inside iron railings. The stone is said to weigh over 7 tonnes. According to authoress, Elizabeth Sutherland, in her delightful book The Pictish Guide, 1997, of the stone she says: “It is undoubtedly one of the finest examples of Dark Age sculpture in Europe and should not be missed”. The town of Nairn is 10 miles to the west on the A96 and the town of Elgin is 11 miles to the east also on the A96. Sueno’s Stone (Swein’s Stone) is a ‘highly sculptured’ Old Red Sandstone pillar standing on a low, stepped base at between 21-23 feet high (6-7 meters) that is thought to commemorate a battle or battles that took place in the mid 9th century AD, according to the legend. Many of the decorative scenes depict Dark Age battles which took place in Scotland, but there are is also a strong Christian theme running through much of the ornamentation, and very beautiful it all is too. There are, however, no Pictish symbols on class III stones. The general thinking is that the battle scenes depict King Kenneth MacAlpin and his victories over the Picts circa AD 842, or could they in fact be earlier in date or, indeed, slightly more recent? We don’t even know for certain who “Sueno” was. The authors Janet & Colin Bord in their book Ancient Mysteries of Britain, 1991, suggest that “Sueno for whom it is named may have been a Norse king defeated near this spot by the Picts”. It seems ‘quite’ likely that the stone was moved to it’s current position from somewhere nearby having apparently lain buried in the ground for some considerable time; the very first reference to the stone came in the early 18th century. 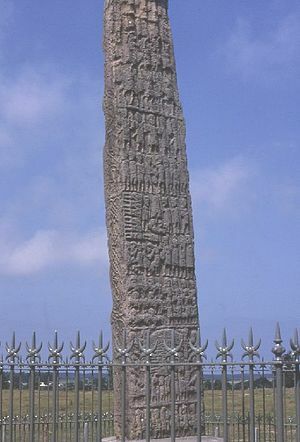 On the front side of the pillar there are 11 panels with ‘many’ horsemen riding into battle and numerous human characters, probably Pictish warriors, but also characters not involved in any battle but, which could possibly recall the coronation of Kenneth MacAlpin, in particular the two tall figures bending over a seated figure – now echoed by a few leading experts in the field. The best part is quite obviously the very large wheel-headed cross with it’s long shaft on a rectangular base in the centre of this face; this being the part that seems to draw our full attention and, was probably meant to do just that because it takes up most of the face; there is also the more familiar knotwork interlacing both on the shaft and on the sides. The opposite side (back) is quite literally covered in upto 100 figures, elite warriors and horsemen all in 4 panels. The general concensus by historians on Pictish history with regard to this side of the stone is that the carvings say out loudly: ‘the Pictish kingdom is finished and the Scots are “victorious” and here to stay – make no mistake about that’. King Kenneth MacAlpin is now in charge. In panel 1 there is a row of figures holding swords and standing above eight warriors on horseback (in three rows facing left); another row of warriors in panel 2 – the middle figure wearing a kilt could be King Kenneth MacAlpin? Another row has eight figures with the two in the centre, fighting and, a third row has six severed heads with a bell and next to that six corpses without their heads, while a warrior is about to behead a seventh figure; beneath that two couples are fighting with their hands. The fourth row has more mounted warriors fighting (in three columns) and making their escape from warriors on foot. In the third panel there are yet more warriors in pairs and, in the centre what is perhaps a bridge, tent or a broch with corpses and severed heads beneath it, while below that two pairs of figures orating the battle scene. Panel 4 shows two rows of warriors facing left with the four front figures unharmed and chained and their victors with sheilds and swords following them. The edge of the stone (right) is carved with leaves and plants and the heads of beasts linked and intertwining, while below that two human heads; the left edge shows more beasts, interlacing and men with fish tails interlaced to form figures of eight; three more heads can be seen beneath this. It is thought the stone was actually set up by the victorious Kenneth MacAlpin who had now become king of the Scots – thus ending the rule of the Picts in Scotland. The Picts now had to accept the ‘inevitable outcome’. MacAlpin died in AD 858 or 859 – having ruled as king of the Picts and, later of the Scots from circa 834 AD. He died at Forteviot in Perthshire and was buried on the Isle of Iona. Sutherland, Elizabeth., The Pictish Guide, Birrlin Limited, Edinburgh, 1997. Bord, Janet & Colin., Ancient Mysteries of Britain, Diamond Books (Harper Collins Publishers Ltd), 1991. Jackson, Anthony., The Pictish Trail, The Orkney Press Ltd., St Ola, Kirkwall, Orkney, 1989. Categories: Pictish Symbol Stone, Sculptured Stone | Tags: Pictish Stone at Forres in Moray Scotland, Sueno's Stone at Forres in Moray Scotland | Permalink. I am interested in holy wells, standing stones and ancient crosses; also anything old, prehistoric, or unusual. Oakworth Old Lane Cup-And-Ring Stone, Cowling, North Yorkshire.